After 204 days, 10 Countries, 17 Flights, 72 hotels/hostels, 65 Buses, 44 ferries/boats, 13 rented moped, 2 rented campervans, 1 rented car, an unquantifiable number of taxi/moto/tuk tuk and approximately 75,000 Kms later, we are saying farewell to the blog. We came away as boyfriend and girlfriend, we return to the UK engaged to be married! We came away pale and (perhaps) slightly overweight, we return a little tanned and over 3 stone lighter between us. 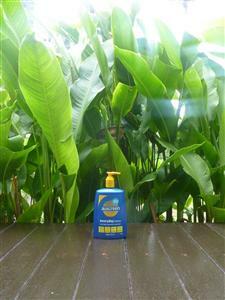 We said a sad farewell to our Aus Screen suntan lotion. This suncream had become like a friend to us. 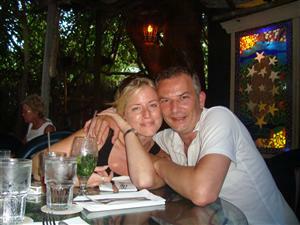 We met in a supermarket in Byron Bay, Australia and since then he has never been far from us. Perhaps he was the most well travelled sun cream in history? We thought he was everlasting but he dispensed his last in Ao Nang, Thailand. We leave you with one of the last known shots of Aus Screen looking resplendent in blue and yellow! For our final two weeks, we are just relaxing and avoiding any bus journeys! Currently we’re in Koh Lanta, it has been the perfect tonic to a hectic travelling trip – very quiet, few tourists and the beach pretty much to ourselves. 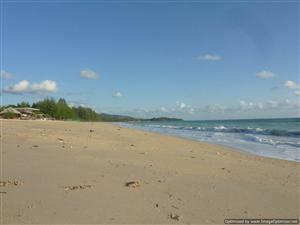 Koh Lanta - Long Beach, where is everyone?! 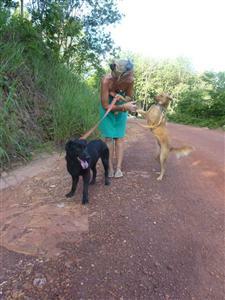 We volunteered to walk dogs at the local animal Sanctuary so took Punky and Crusty for an afternoon stroll. We return back to Ao Nang for a few nights on Tuesday and hope to do some more snorkelling. 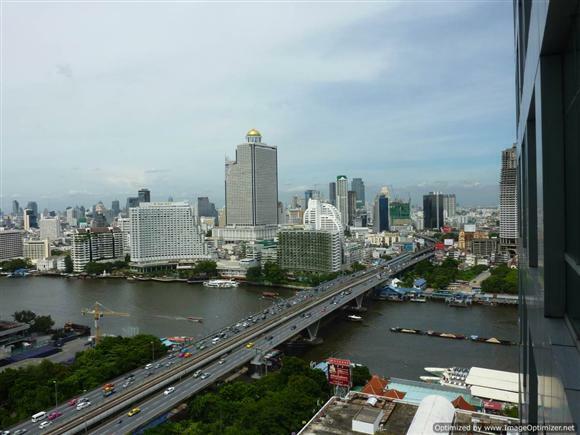 Then head to Bangkok for the final few days before flying home. Thank you to everyone for looking at the blog and a bigger thank you to those who have left comments. We have had over 2200 hits on the blog since it started but we think about 2199 hits are our parents! We appreciate that some of you may be rather blue that the blog has come to a close. However, don’t worry we’ll be home soon and we can show you the 4000 pictures we’ve taken!! From Chang Mai we flew down to Phuket and had a couple of nights there. 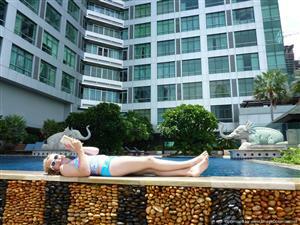 We didn’t do an awful lot other than laze around the pool hence no separate blog entry. 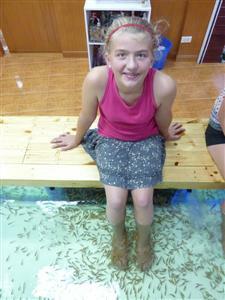 We moved onto Ao Nang, this was the final part of the trip for Polly before heading home to the UK. Decided just to stay in Ao Nang for 6 nights and have day trips out rather than move around. It was really good to settle in one place and unpack our rucksacks. We pushed the boat out a little and stayed in a very nice hotel set back from the main street so it was nice and quiet. Booked a boat trip which toured 4 of the outlying islands on a long tail boat with some snorkelling. The islands were beautiful, all very bounty like, with white sands and clear aqua water. 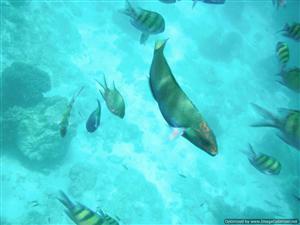 Snorkelling was also brilliant with quite a large variety of very friendly fish! 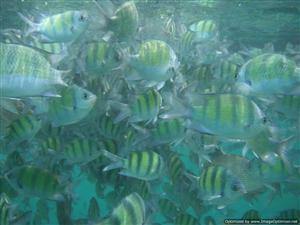 Our underwater camera seems to have worked quite well, so got some decent photos too. Most of the rest of our time was spent relaxing by the pool, which was wonderful. On the last day we decided to go on a speedboat trip to the Phi Phi Islands. The boat stopped at several different locations, yet more idyllic beaches and snorkelling sites. One of the stops was Maya Bay, which was the location used for the film “The Beach”. We're not having a good time!!!!!!! It was pretty stunning, although it was full of speedboats! Despite it being rainy season we had been lucky with the weather so far, however within about 20 minutes a storm blew up. The beach cleared very quickly, a very strong wind appeared and we were in the middle of a sandstorm! It was pretty rough back on the boat, but we headed away from the storm and things calmed down again. Ao Nang beach was in sight on the return journey when the boat slowed down considerably.. we then ran out of fuel! The boat was adrift for about 40 minutes before another boat came with extra fuel and we eventually got back to the hotel. As it was Pollys last night we decided to ignore the budget and went to a locally renowned steakhouse. We all made a bit of an effort and were almost dressed up! It was a fair distance away so we got into a motorcycle with side car taxi thing, which had been totally pimped up with huge speakers and neon lights. It was a nice touch when he specially selected a song called “Beautiful Girls” – what a smoothie! We had a great meal, the steaks were amazing and we even had wine, it felt like a real treat! 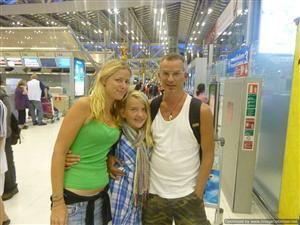 The next day we all flew to Bangkok as Polly was flying back to the UK that night. Its been great to have her with us for so long and there was an emotional goodbye at the airport. It will be strange without her but it won't be too long before we are back in the UK. 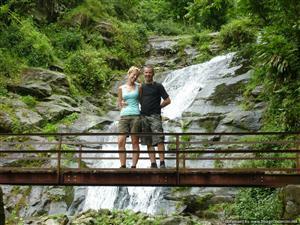 The journey from Luang Prabang to Chang Mai was of epic proportions. We were picked up from our hotel at 6pm and the bus left the station at 7pm, a little surreal at the station as The Great Escape was playing on the TV! The bus stopped innumerable times for reasons unknown, one stop was to collect the animal they had run over (we don’t know the identity of the victim!) It is said that a picture speaks a thousand words, perhaps this is one of them? Somewhere in Laos - Does my hair look alright! We arrived at the Laos town of Houay Sai at around 11am, it was then a tuk tuk ride to the border itself to check out of Laos, followed by a boat ride across the river to get stamped into Thailand. We were horrified when the guy trying to sell us a (very expensive) mini van ride to Chang Mai advised that the public bus took a further 12 hours. Ignoring him, we got another tuk tuk into town and paid £12 quid for the public bus (instead of £90 for a mini van), a further 7 hours later we eventually arrived in Chang Mai. In total the journey took 26 hours and involved 7 different vehicles/boats! As you can imagine, we were exhausted and extremely hungry when we arrived. Polly’s face lit up when we decided fast food was the order of the day for dinner! The next day, as we were still jaded, we just had a stroll round. We went to have a massage by blind masseurs to try to rub away some of our aches and pains from the previous days travelling. In the evening, we found a really great place to eat where you can pick your food from a number of different stalls – you choose from Thai (obviously), Indian, Japanese and Western dishes. We mixed and matched from various places and had a right feast. On the way back, Polly spotted a CD/DVD stall. After about 15 minutes we walked away with 6 CD’s of dubious legality! 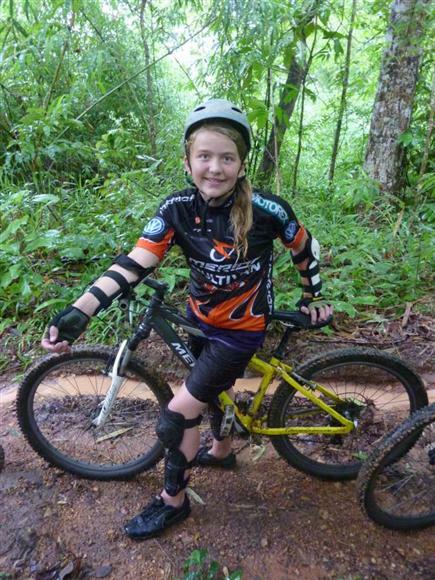 Chang Mai is a kind of Mecca for mountain biking so the following day we went for a ride. We were taken by pick up to the top of a mountain outside of Chang Mai – 5400 ft according to the marketing material. Once the leader had cleared a baby Cobra from the forest floor (I jest not), we had a bit of formal instruction and they assessed our riding abilities – this consisted of riding over a branch! We then jumped on our bikes and set off. 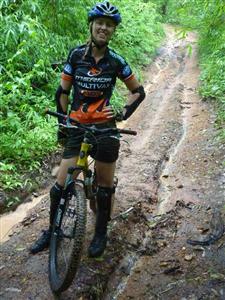 Chiang Mai - Biking before the rain! Unfortunately, the cloud was very low so we didn’t see any of the spectacular views we were promised. The first part of the ride was on quite a good track and was really easy. The group stopped at a coffee plantation for refreshments and then it was into the saddle again. Within 10 minutes of riding the thunder started and within 20 there was torrential rain. By this time, the track had become quite challenging in places made all the more hazardous by the streams that were forming where we were trying to cycle. It was fairly miserable to be honest and my fellow cyclists (Emma & Polly) were extremely slow. Polly was becoming more and more disillusioned with the whole mountain bike thing, this culminated in her falling off (several times). Thereafter, she flatly refused to get back on her bike. I got increasingly annoyed and tried to ride my bike whilst pushing her bike, this resulted in me coming off my bike and pretty much impaling myself on the handlebars. In the end we had to tell the rest of the group to carry on without us. Lunch was included in the day, however it took us such a long time to get to the end, it was gone 4pm and all we wanted to do was to get back to the hotel and get out of our wet muddy clothes, but we had to polish off some green curry first! I guess looking back it was fairly comical, like some spoof programme you might watch on the TV. However, at the time, I was fuming mad! In fairness to Polly, the track was pretty treacherous and I think I underestimated how much she had hurt herself when she fell off. Needless to say, we will not be doing any further biking activities together, EVER! Looking back perhaps we should have realised that friday the 13th was not a good day for this kind of activity! 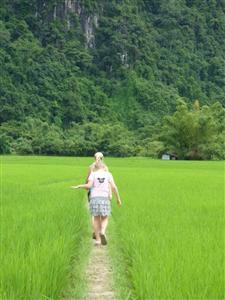 In our wisdom we paid additional money for a mini van from Vang Vieng to Luang Prabang. 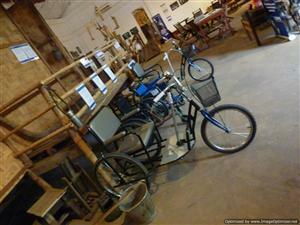 The picture in the tour office was of a very new looking people carrier which we were assured had air conditioning. What we actually got was a pink and white van with no air conditioning! The journey wound up and down through mountains with spectacular scenery. 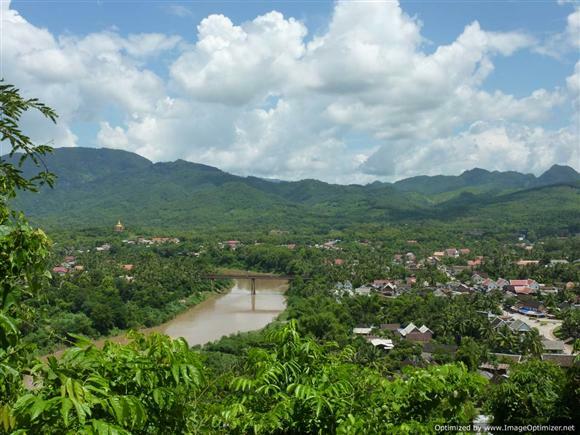 Luang Prabang is another Unesco site, it has lots of beautiful old historical buildings and is surrounded on 3 sides by mountains, bisected by the Nam Song and Mekong rivers. On our first night we had a great meal at a restaurant that specialised in traditional Lao Barbeque food. As a bonus, we got a free drink! 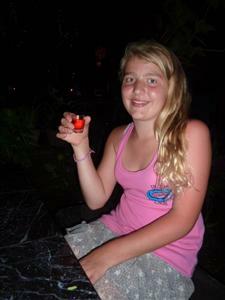 Luang Prabang - Free shooters, yum! Our table was transformed into a barbeque with the arrival of a burning bucket of coal and we proceeded to cook (both ourselves as it was pretty hot –and the meat!). We all really enjoyed it and tried buffalo for the first time, which was tasty! The following day we trawled around various tour operators, looking at elephant related activities. We were determined that whatever we booked had to be conservation based rather than just a tourist attraction offering elephant rides. After the trawl around and a heated debate over lunch we booked ourselves on a one day Mahout course for the following day. We awoke the following day to torrential rain but were picked up from the hotel and taken to Elephant Village (http://www.elephantvillage-laos.com/). It was quite a sight when we got there to see elephants up close and personal. We first went on an elephant ride through the jungle for an hour, unfortunately, the rain had not subsided but it didn’t detract from the experience. Once we got back, our group were taught a few basic commands and then we were boosted up onto the elephants neck to have a ride. This was a totally different experience to riding in a chair (obviously). I know it is stating the obvious but you are incredibly high up and as the elephant walks you are swayed from side to side by its hips, you almost felt in a permanent state of falling off! Elephants are actually very bristly, its like a stiff brush rubbing against your knees! 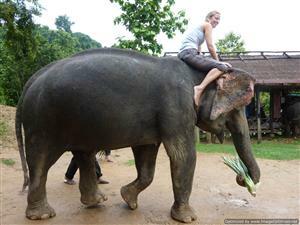 Its also a slight worry that you are on the elephant on your own after just a few basic instructions! 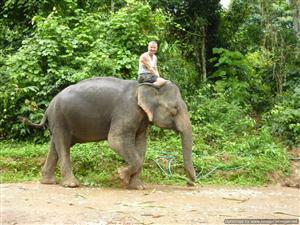 Once the mahouts were happy with our abilities, we rode the elephants down to the river to give them a bath. 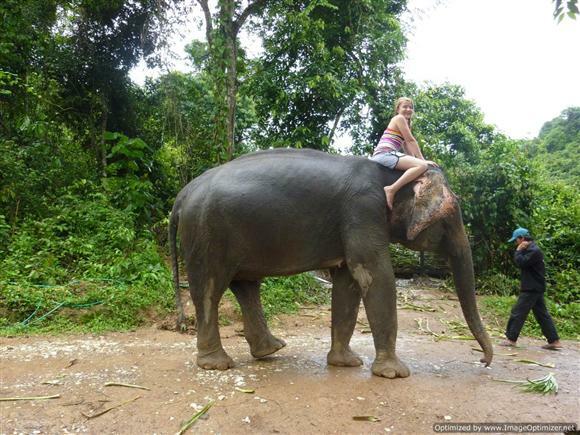 It felt very strange to ride the elephant into a river until they were completely submerged. We gave them a good wash down and there was lots of splashing around. I cannot begin to describe what a fantastic experience this was, it was pure magic, I think this photo maybe sums it up? By now the weather had really changed and it was hot and sunny. After lunch we went on a boat ride up the river to Tat Kuang Si. 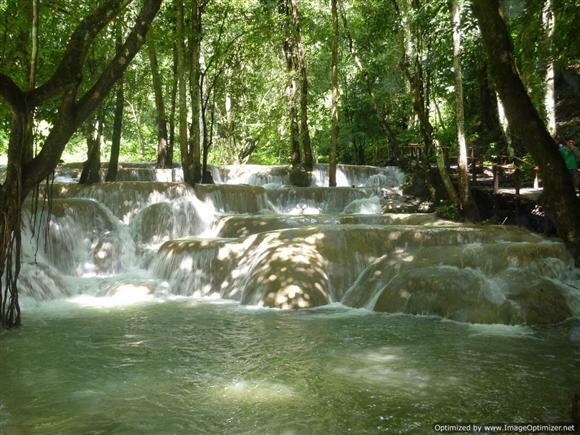 This is a series of waterfalls and pools which cascade through the trees. It was very picturesque and really nice to jump in the clear water after bathing the elephants in the muddy river. Tat Kung Si - Nice! 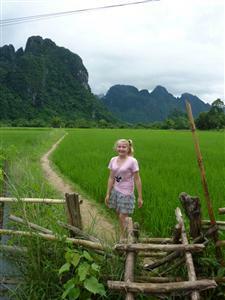 We arrived in Vang Vieng after a 3½hr bus journey from Vientiane. We were met by the usual people trying to get you to stay at their hotel. Then Dad and Em decided we were going to stop somewhere for an iced coffee (that’s all they drink nowadays, I’m surprised they haven’t turned into one yet!). After having iced coffee we walked to our hotel, I knew it wasn’t far, but it seemed like miles with all our luggage. Finally we got to our hotel, it was actually quite nice and had a good view of the river. Like in Vientiane, Dad and Em thought it would be fun to go for a walk as there were meant to be some ‘‘nice’’ caves nearby. We went across the bridge to a cross paths (paths because they weren’t roads!) with three signs about caves all of them saying they were the most beautiful, which didn’t help. In the end we decided on one path but the way was sooo muddy it was like walking through a swamp. I slipped and got a muddy knee, it was soo funny. We decided to turn back and try a different cave. Instead, we went to Tiger Cave that led us through three rice fields, The path was only a foot wide, which I wasn’t happy about at all. In places you had to jump across gaps filled with water, in other places bits of bamboo had been put across. After wading through a river, Em had had enough and was not going any further. Dad and I continued on as we thought the cave was really close. By this time we were permanently wading, the path had disappeared under water! It then started to rain heavily, great! We had to scramble up a steep path to get to the cave, Dad fell over and I started to laugh and then I fell over as well - we were both soaking wet and covered in mud. The cave wasn’t really anything, more like a gap in a cliff, not sure whether we got to the right place or the locals were trying to get some money !? We trudged back to the hotel, I wasn’t really that happy that lots of the locals were laughing at me. I was so muddy, it looks as though someone had dragged me through it. It seemed to be Dad’s mission for me to eat vegetables and not have any Fanta’s (yawn) . We ate in a local restaurant, I had some of Emma’s curry and it was actually quite nice. The meal was really cheap, so we decided there and then that we would probably eat here again the next night. The following day we went “Tubing”. 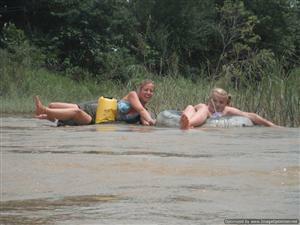 Tubing is where, you hire a large tractor tyre inner tube and get taken by tuk tuk to the river about 3 kms away. 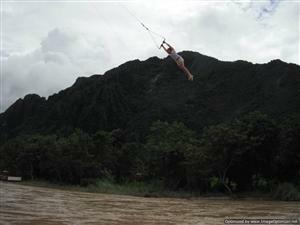 You then jump into your tube and float down the Nam Song river back to Vang Vieng. Within 100 metres, Em & I got stuck on reeds. The river was really strong so we managed to use each other to get ourselves out. There are lots of bars that are on the banks of the river and they encourage you to stop by throwing ropes to you and pulling you in. We were told that the first bar was the best one so we had only gone a little way before we were pulled in. Dad and Emma ordered a drink that came in a bucket! I was actually allowed a Coke for once! The bar was really busy and they were playing music REALLY loud. The best thing was that they had a trapeze set high in a tree that went over the river. People would queue up in the tree and whenever anyone jumped off the whole tree wobbled. I persuaded dad to let me go on it, MAJOR adrenaline rush when you let go to land in the river. The first time I did a bomb so I didn’t go that deep, check this out - http://www.youtube.com/watch?v=iJewh_LS8e0 (you might want to turn your sound down!) It was aaaaaaaaaaaawesome you get thrown a rubber ring on a rope and you hold on while someone pulls you in it was really fun. 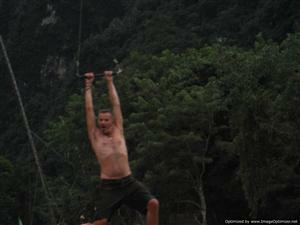 Vang Vieng tubing - Bad Tarzan impression! I had to get dad or em on it but emma was totally against it so I got dad on , he almost chickened out but he did it and loved it. That was quite enough for him and after I had about 5 more goes on the swing we left but it was really funny coz everyone was at the bars so the river was empty. 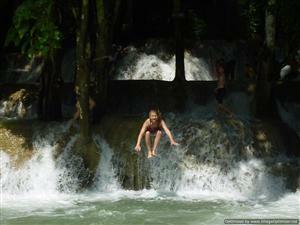 Vang Vieng tubing - Messing about on the river! It was really relaxing but getting out was quite hard coz we went the wrong way so a local boy had to come and save us. We all got abit bruised but it was sooo fun and when I am old enough to go with friends I will . Awoke at the unearthly hour of 3:45am. We went into the lounge where Polly was sleeping and were astounded to see her up and dressed already – think she was proving a point!? Not good at mornings let alone this early, even breakfast is a struggle at this time! Our pick up was arranged for 5am to take us from the apartment to the airport. We flew from Bangkok to Udon Thani in the North East of Thailand, from there it was a taxi into town and then about an hours wait for the bus that would take us across the border into Laos and onto Vientiane. Although the journey was fairly long in total, the different modes of transport broke it up quite nicely. After manic Bangkok, it was good to get somewhere with a more sedate pace. 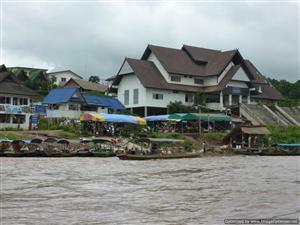 Although Vientiane is the capital of Laos, the population of the city is quite small. Our hotel was situated in a quiet backwater with hardly any traffic, it seemed a little surreal. Much to Polly’s disgust, we did a large walking tour of Vientiane the next day taking in some of the bigger sights. First up was the market (groan!) and then Patuxai which looks a little similar to the Arc du Triomphe. You get a good view from the top looking down the main road towards the Presidential Palace. 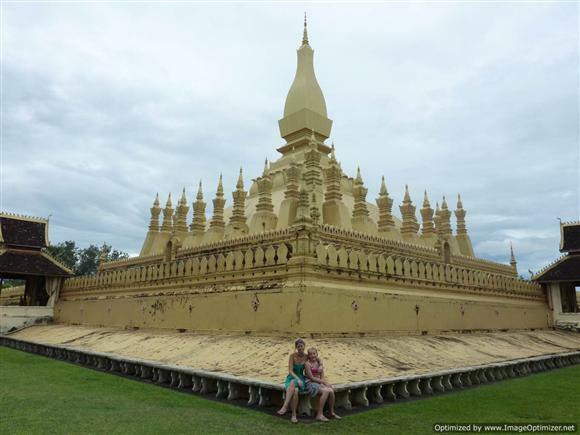 From there we trudged on to Pha That Luang, Laos’s most important monument and (according to Lonely Planet) a symbol of the Buddhist religion as well as Lao sovereignty. Em was somewhat perturbed by a monk who was caught short there and relieving himself against the monument – I don’t know, monks these days! Although it was impressive, its not as gold as the pictures lead you to believe. 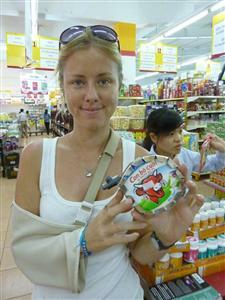 One of our objectives with Polly was to try to get her to be more adventurous with food. This was achieved on night 2 when we went to a restaurant with no English menu. We pointed to a couple of pictures on the menu and had a great meal of barbequed meatballs and make yourself spring rolls washed down with a bottle or two of Lao beer. Vientiane - You will eat it! The following morning we made a visit to the Thai consulate as Em and I knew we would have an issue with our Thai visa. Strangely when you cross into Thailand over a land border they only grant you 15 days in the country. Once in Thailand you can only extend for 10 days at a cost of £40. Whichever way we looked at it, once Polly had gone home, we were going to have to leave Thailand and re-enter if we didn’t sort out a different type of visa. We managed to do this at the consulate for no charge but it meant staying in Vientiane a day longer than we planned. From Cope we cycled back to the Thai consulate to collect our Passport with a nice shiny 60 day visa contained within. The next blog entry will be narrated by our guest editor, Polly Nicholl! After so much travelling, it was great to have some proper downtime, we even fully unpacked our rucksacks – the first time in a long time. It seemed very novel to have our own place and be able to go to the supermarket and do simple things like watch a film and cook a meal! We had a very emotional Reunion with Polly and some tears were shed. It appears as though she has grown a foot since I last saw her. She really enjoyed flying out on her own, made that much more enjoyable by two brothers who were also flying unaccompanied. Dont think Polly got much sleep on the flight, much time was spent chatting with her new found friends and watching films! 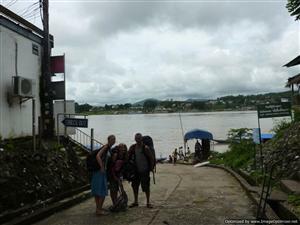 We had to sort out Visas for Laos which meant a visit to the embassy, this was quite a trek from where the apartment was. In the evening, we went to the Khao San Road. Polly had already managed to lose her sunglasses in less than 24 hrs so we did a bit of sunglasses shopping.She also spotted a fish massage place and insisted on giving it a try – we left her to it as we had already tried it in Cambodia and decided it wasn’t for us! The following day, we soaked up some sun by the pool before heading to Chatuchak market in the afternoon, one of the biggest markets in the world. We had a good wander around with Polly, once again, buying a few bits and pieces. We then went to a smaller market which sold vintage odds and sods before making tracks back to the apartment. 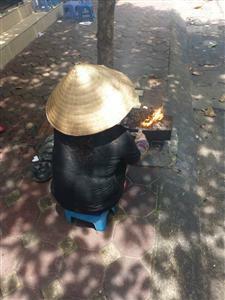 We had a few days in Hanoi before we headed to Sapa and then came back again after Sapa. In those initial few days, I can’t say we were that impressed with it. The moped traffic is appalling and there are hazards everywhere from drain missing covers that threaten to swallow you whole to spitting fat from pavementside woks. Some local even had the audacity to try to pick pocket me, needless to say, he was rumbled mid fumble. However, the city did grow on us slightly on the second stint. 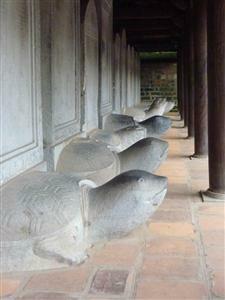 The old quarter is an assault on the senses and the clichéd scenes that you imagine in Vietnam are everywhere you look. There are little cafes that just pop up on the pavement, people selling fruit, veg, meat from just a mat laid on the ground in an alley and the offer of moped taxi’s at every corner. The lake in the middle of the city is really pretty with a lovely temple which sits on its own island. 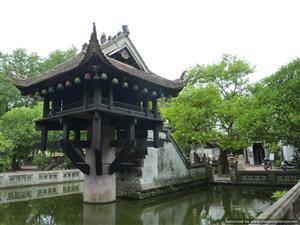 We visited the one pillar pagoda which is an oasis from the traffic noise. We went to Ho Chi Minh’s Mausoleum but didn’t go in...Visited the temple of Literature which was really beautiful although somewhat marred by tat shops and a cashpoint despite it being an historical site! We had a somewhat frustrating visit to the supermarket, admittedly we were already frustrated as we entered as it had taken us an age to even find the place. We looked around and the things that we had specifically gone there for they didn’t have. We bought a few basic provisions for the fridge at the hotel, we shook our heads when we found the Laughing Cow triangles were security tagged whilst bottles of wine and spirits weren’t! We upload this at Hanoi airport where you cannot exchange foreign currency yet duty free sell microwaves. Also very angry with myself because I forgot my Swiss army knife was in my wallet, this was obviously confiscated at security. Feel slightly bereft, the knife and me go back a long way and it has been one of the most useful things we brought with us. Whilst Vietnam has many, many idiosyncrasies we have really enjoyed our time here and it is perhaps the most diverse country we have visited. Despite warnings from other travellers, we found the people very friendly, helpful and charming (other than the pick pocket). It is now only a few days before Polly joins us which we are really looking forward to, we are hoping she might even guest write a blog entry!! 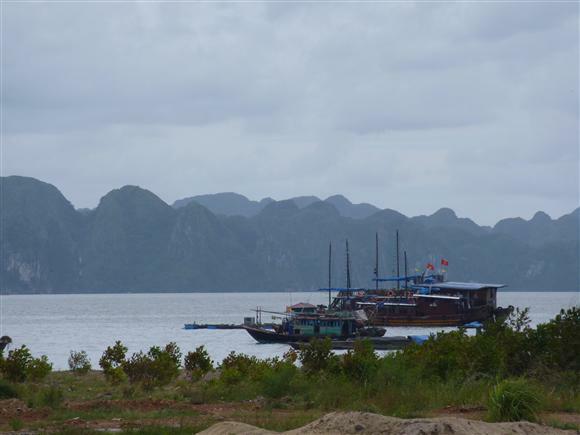 Somethings are just not meant to be and I think we were destined not to see Halong Bay. We booked a day trip on Friday, even got up early, to be told that our trip had been cancelled because of bad weather. 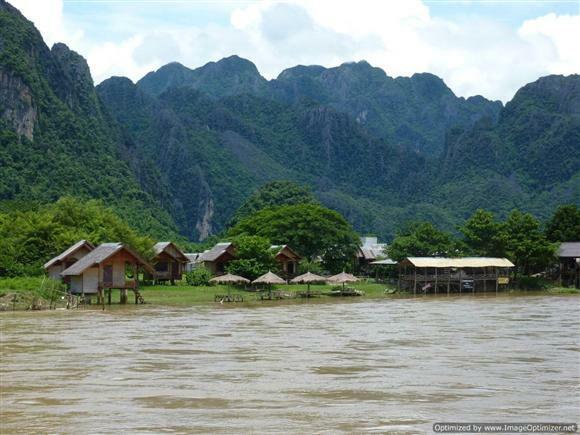 We re-booked for the following day hopeful that we would get to see the mighty limestone peaks rising from the sea. We were up early again and were told by hotel reception the trip was on, we got excited! The bus journey was bumpy, its strange that the road to a Unesco World Heritage Site is so bad. An obligatory stop was made, conveniently at a large shop selling various tourist tat, we bought a coffee but it was awful (not a good sign). 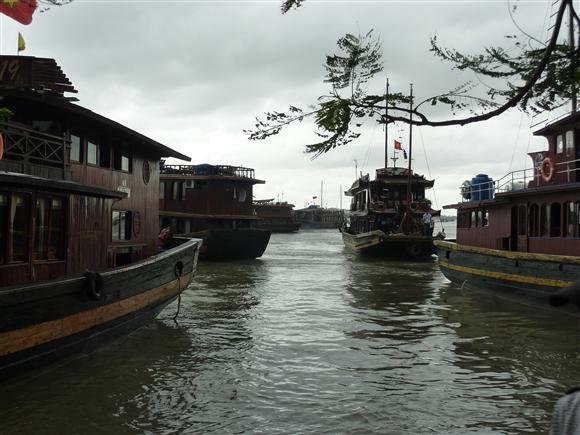 After 4 and a half hours we arrived at Halong Bay to be told that no boats were currently leaving the harbour due to potential bad weather. However, all was not lost, as we could have lunch and hopefully after lunch, good luck permitting, boats would be able to go out. So, our seafood banquet on a boat became one prawn, some rubbery squid and a spoonful of rice. Lunch was followed by more hanging around by the restaurant, the tour guide announced that there would be another announcement in 15 minutes. The news came that we could go and we were hearded back on the bus for the short drive to the harbour. The harbour itself was packed, stadium rock concert packed. We waited right on the quay, the boats were so near we could touch them and smell their fumes. We waited for an hour while the tour guide made numerous calls, presumably to his mother to ask what was for dinner as we didn’t appear to be going anywhere fast. Then there was another announcement, that we would wait another 15 minutes to see if we could go. Needless to say, we didn’t. We went back to the bus and as we left Halong Bay, the tour guide said “wave bye bye to Halong Bay”, I could have punched him. We are still not sure why no boats were allowed to leave the harbour, we think that it was the harbour authority. However, what we really don’t understand at all is why we had to go all the way up there to find this out. Being cynical, we wondered whether the tour company took everyone up there knowing that they could at least fleece us of some money for the bus ride and a dodgy lunch. Or perhaps it was a government ploy to ensure you had to come back again? The conspiracy theories continue even as I type! To cap it all off, we got stuck in a traffic jam on the way back to Hanoi. In all, the trip or non trip took 13 and a half hours and cost 22 dollars. This, without doubt was the most frustrating day of our trip since leaving London on the 7th February. HaLong Bay - you can just about see it! We stopped in Hanoi for a few nights to organise the trip to Sapa (separate blog entry on Hanoi to follow as we have to return there). We were hoping to get the train to Sapa but were distraught to learn that it was fully booked. Pizza in hand, we trudged onto another sleeping bus. We awoke at about 330am with the bus stationary on a windy mountain road, looking out the window we could see several other vehicles also stopped. We got up and out and went to check out what the problem was. 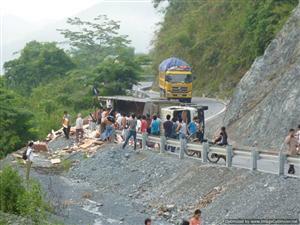 About 200 yards further up the road was a small truck on its side blocking the road – we knew we would be here a while. The accident was miles from the nearest town, yet several entrepreneurs arrived on mopeds selling cold drinks and baguettes – only in Vietnam! At around 730 a crane turned up which we thought would move the truck out the way – wrong. From what we can gather the driver of the crashed truck did not have the funds to pay for the crane to move his truck out of the road. By this time there was quite a crowd and by bumping the truck from side to side, a large group of people managed to move the truck far enough for traffic to pass. 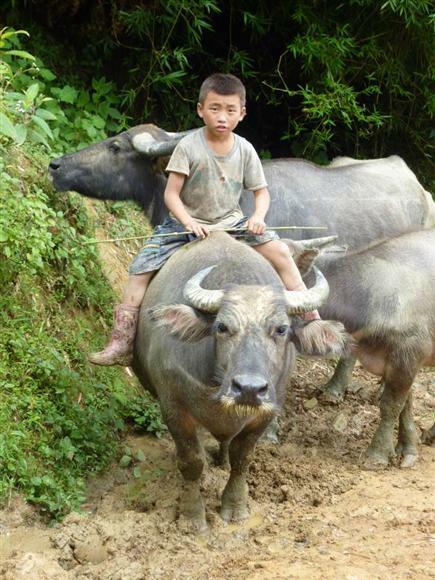 This goes down as our record so far, it took 16.5 hours to get to Sapa. 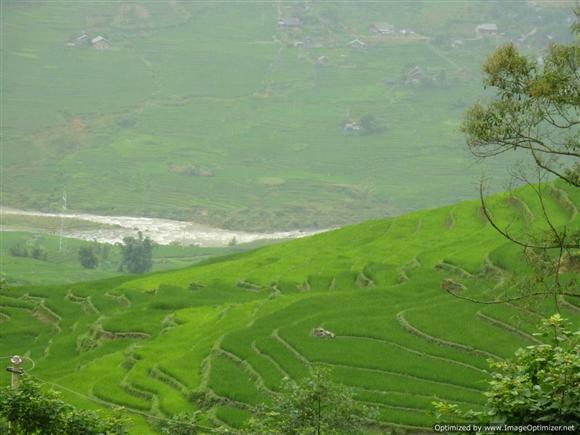 Sapa is relatively high up so, similar to Dalat, much cooler. To be honest, the heat at our last 3 stops had become unbearable so it was really good to have cooler weather. 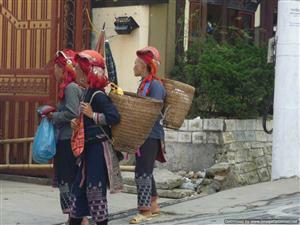 The surrounding mountains are home to a number of ethnic hill tribes, particularly Bllack H’mong and Red Dzao each of whom have their own distinct traditional dress. 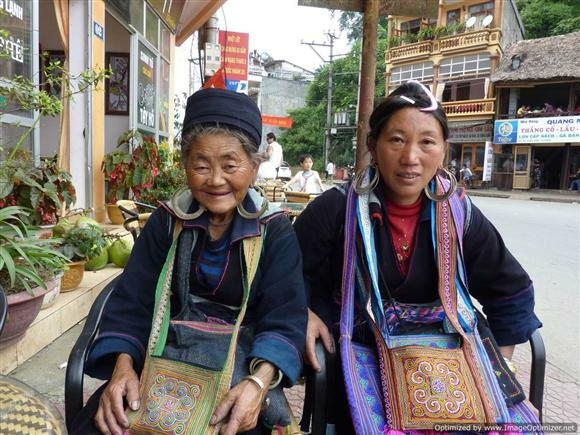 Once we were off the bus we headed for a caffeine fix and were immediately befriended by two Black H’mong ladies who were rather insistent we should buy something from them. They were actually really sweet, particularly the old lady who was seventy. They didn’t speak a huge amount of English but despite this, through their actions and gesticulations, they made us laugh. When we wouldn’t buy anything from them, the older lady wanted to make us pinky swear we would buy something later, we thought this was highly amusing!!. It soon become apparent that the H’mong people have a tendency to latch onto and follow you around, this can be a little unnerving. I managed to teach one lady two new English words – stalker and blackmail – this after she followed us around for 30 minutes but promised she would leave us alone if we bought something. Sapa was incredibly busy and we were both surprised at the sheer number of tourists. A couple of fellow travellers on our bus really struggled to find somewhere to stay. 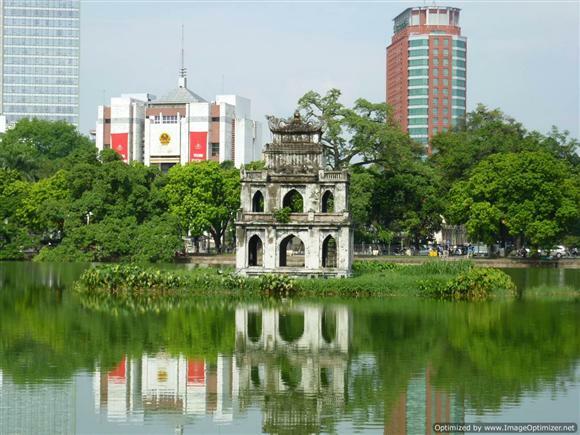 It was also the most expensive place we have come across in our travels in Vietnam, the extra money does not equal extra quality here as we were to learn from our hotel! We did a day trek which took us through some truly stunning scenery, the terraced fields here are like nothing we’ve seen before, the sheer scale and beauty of it is jaw dropping. 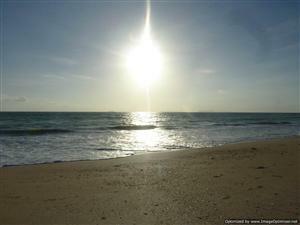 Although the weather wasn’t great, hopefully you will see what I mean from the photo’s. The first part of the trek was fairly strenuous, up hill for about 2 hours, thankfully thereafter it levelled out for the rest of it. We had 3 guides for our trek, two Vietnamese guys and a black H’mong lady (Shu). As we neared the end of the trek, we passed Shu’s house and she invited us in. The accommodation was pretty basic with an open fire for cooking and although they had electric, there only had one light bulb. We were very grateful to her for showing us her home and we even met some of her family and neighbours. Once again, the train was full for the return journey so after procuring a pizza, we headed onto the overnight bus that would take us back to Hanoi.